Earthquake shook UAE on Tuesday afternoon for the second time in April. Residential and commercial buildings and hospitals in Dubai, Sharjah and Abu Dhabi have been evacuated. People have been standing outside their buildings fearing aftershocks. Jebel Ali, Sheikh Zayed Road and Emaar Square all seeing crowds under the buildings after the earthquake. According to Emirates 24/7 reporters, Al Garhoud hospital has been evacuated and buildings in Jumeirah Lake Towers and Dubai Marina have been evacuated. There have been also been reports of earthquake in different cities of Pakistan, India and Latin America. Iran reports 7.5 magnitude earthquake in southeast. The National Center of Meteorology and Seismology have confirmed the earthquake, 7.8 in magnitude, struck Iran. 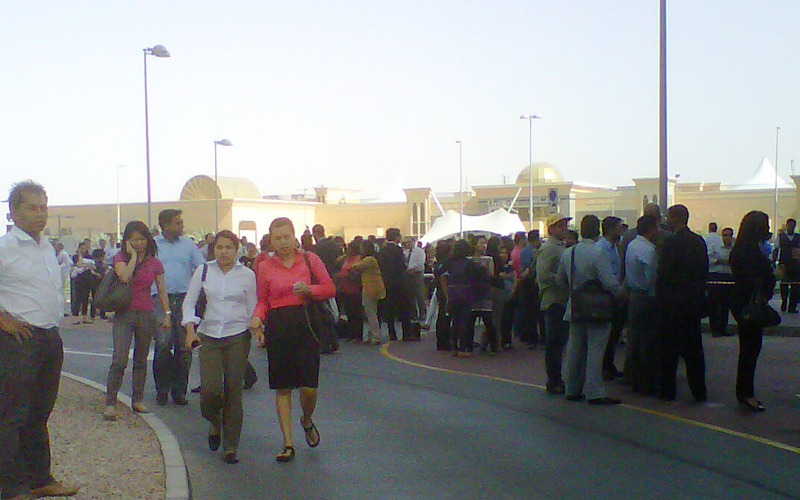 Eyewitnesses said MBC office in Media City have also been evacuated after the tremors. That the quake was stronger this last weeks tremors was agreed upon by everybody. People in offices spoke of shaking chairs and tables. "I am on the 6th floor of my building, and everything started shaking. I got panicked. I walked down the stairs and everything turned blue in front my house. I thought the building would collapse on top of me," describes Kinana Homsi-Mardini (27) from Syria, who works in Tecom. This time most buildings were immediately evacuated. "Last time we did not move. But now we were told to all evacuate. And now we are told to move away from the building," says a Damac employee in Downtown while standing outside. "My chair and table started shaking. This was a much stronger quake than last time. It was very obvious," says Lesley (29) from the Philippines, after she evacuated from Atrium Tower. "For most of us it was the first time to experience an earthquake. It id quite shocking," says Hassan (55) from Sudan, evacuated from the same building.